You've watched the beautiful Manitoba landscape transition from majestic prairie to towering Boreal Forest, from the cold lakes of the Taiga to the barren beauty of the Tundra. All the while leaning back in your comfortable chair, warm in the embrace of your wool sweater. As you sip your steaming cup of coffee, you read about polar bear excursions for the hundredth time and check your camera. You won't want to miss a thing! The Winnipeg-Churchill train completes the 1,700 kilometre journey (over 1,000 miles!) to the vast subarctic region of Northern Manitoba in two days. See polar bears up close from the safety of 'tundra buggies.' Watch northern lights dance across vast Arctic skies. In the summertime, kayak with the belugas under a midnight sun. All year round, choose the relaxing ambience and attentive service of budget travel in Economy class. You may also upgrade to the comforts of a cosy bed in Sleeper class. 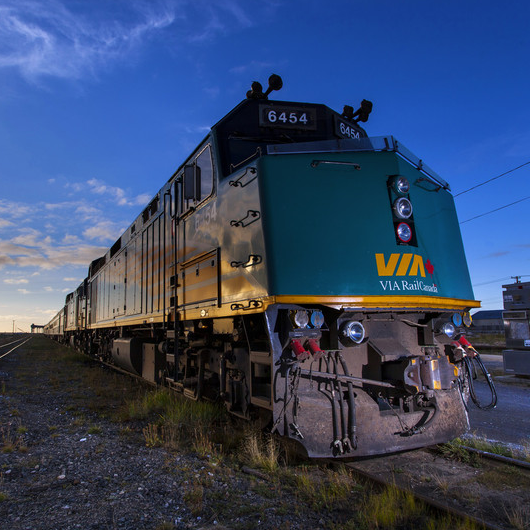 For more information or to book fill out our VIA Rail Point 2 Point request form with your enquiry or contact us.